Size: Snail - 1 1/2", slug - 1/8" to 3"
Identification: Slugs have green blood and are covered by a layer of slime or mucus. Most are gray, tan, or black. Some are green and some have distinctive dot patterns. They leave a slimy trail wherever they go. Eggs are clear ovals laid in jellylike masses. Decollate snail looks like its small end has been broken off. Snail shells are made up of calcium. Biology and life cycle: Adults lay eggs in moist soil. Eggs hatch in two to four weeks, take two years to reach maturity. Life span is one to six years, depending on the species. Eggs are usually less than a quarter inch and often have a thick outer shell of calcium carbonate. They are normally laid in clutches of three to fifty. Feeding habits: Slugs and snails feed primarily on decaying organic matter, but they also have a taste for your best ornamental and vegetable plants. They feed at night (although on damp drizzly days they will stay out all day). Will climb trees or eat on the ground. They like to eat fungi, lichens, green foliage, worms, centipedes, insects, animal feces, carrion, and other slugs. Economic importance: Very destructive to many garden plants and food crops. The decollate snail is predatory and helps to control plant-eating snails, although there is some worry that it will destroy the balance of native snails - but we doubt it. Natural control: Maintain permanent stands of clover and mulches to favor ground beetles and rove beetles (which eat slugs). Centipedes also eat slug eggs. Other predators include small mammals, snakes, frogs, toads, lizards, birds, and carnivorous beetles. In the insect world their biggest enemy is the larva of the lightning bug. Organic control: Copper bands are supposed to work, but they sound like too much work to us. Dust dry hot pepper in problem areas - it works great. Mix with diatomaceous earth for economy. Coarse-textured, crushed hot pepper like as that used on pizza is best. Citrus oil spray works well, and coffee grounds. Broadcast coffee grounds around plants troubled by slugs and snails to run the pest off effectively. Use anywhere from 2 - 5 lbs of grounds per 1000 square feet. Insight: Trapping can be done with banana peels, eaten grapefruit halves, apple cores, and beer or yeast water traps. Putting wood ashes or natural diatomaceous earth around plants helps repel snails and slugs. They all seem to be alcoholics - just one taste and they can't quit. Beer placed in a saucer or pan sunken to ground level will do them in. Slugs and snails do have their good points. They help disperse seed and spores, break down organic matter, and keep down the population of other small pests. A big one called the decollate snail feeds on other snails. Slugs and snails hate caffeine, researchers have discovered. Robert Hollingsworth of the United States Department of Agriculture's Agricultural Research Service in Hilo, Hawaii, and his colleagues discovered this secret while testing caffeine sprays against the coqui frog, an introduced species that infests potted plants. They found that a 1 to 2 percent caffeine solution killed most ofl the slugs and snails in two days. Concentrations as low as 0.01 percent repelled the the pests. A cup of instant coffee contains about 0.05 percent caffeine, and brewed coffee has more. Coffee grounds can also be used to repell slugs and snails but a caffeine solution is much more effective. Caffeine is more effective against slugs than metaldehyde products. The United States bans metaldehyde residues in food, but classifies caffeine as safe. It may even qualify as organic, adds Hollingsworth. ORGANIC CONTROL: Dust dry hot pepper in problem areas - it works great. Mix with diatomaceous earth for economy. Coarse-textured, crushed hot pepper like as that used on pizza is best. Citrus oil spray works well, and coffee grounds sprinkled on top of the mulch also helps. Cedar mulches are also important. Snail control: garlic-pepper tea works pretty well when they are young and just getting started. Mix equal parts molasses, orange oil, and compost tea. Mix 4 oz. Of the concentrate per gallon of water and spray directly on the pests. Also, mix equal parts DE, dry hot red pepper, and fine textured cedar flakes. Dust around affected plants. Fireplace ashes work well, especially in acid soils – rock phosphate, zeolite, and eggshells also work. Iron phosphate is a compound that occurs naturally in the soil. A product containing iron phosphate is Sluggo. It is a pelleted bait that resembles grains of rice. It a blend of iron phosphate, the "active ingredient," which is coated with an attractant (bait). Slugs and snails are attracted to the bait more than plants, even luring them from their hiding places. Ingestion, even in small amounts, will cause them to stop feeding. It stays intact for a week or two, even after waterings or several rains, and provides protection to greenhouse plants, container gardens, vegetables, flowers and fruiting plants and shrubs. This product is obviously much safer to use than those baits containing metaldehyde. Many gardeners have sprinkled a dash of salt on a slug at least once. This is not a good thing, as the salt can make the soil toxic to all but a few salt tolerant creatures and plants. 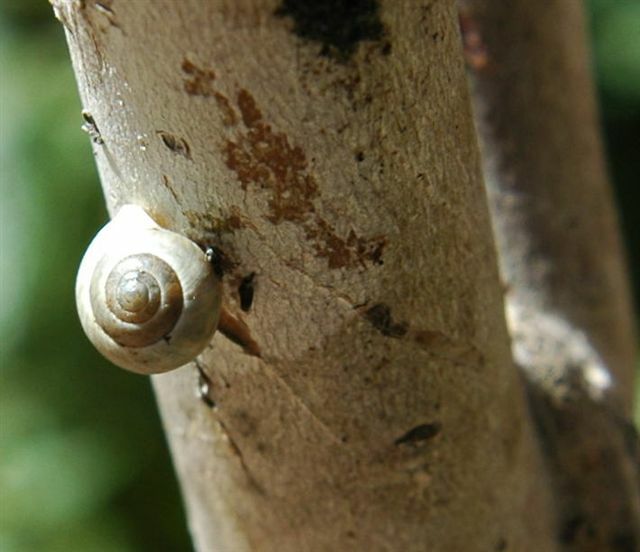 Rumia decottata is a predatory snail, imported from north Africa, and naturalized here in most of the country. It grows to two and a half inches, has a long conical shell and feeds on the round shelled garden snail. It burrows into the soil in hot and cold weather and prefers to feed on snail eggs and small hatchlings. The decollate snail seems to do very little damage to crops unless plants are stressed and showing signs of decay and death. Decollates will feed on some low growing plants and germinating seeds, but they prefer dead plant material. Some people fear the release of non-native species, but they are already here.